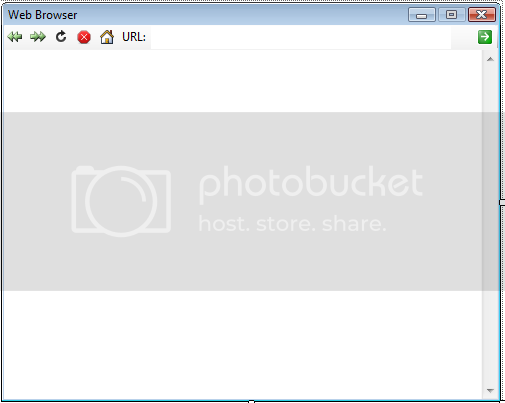 In this Tutorial I will show you how to create your very own webbrowser. You will need: 1 Toolstrip + ToolStrip Controls(explained later), 1 WebBrowser. First thing is first, drag a toolstrip from the toolbox onto the form. Make sure that the Grip Visibility is set to Hidden. Now we will add the controls. You will need:(6 ToolStripButtons, 1 ToolStripLabel, and 1 ToolStripTextBox). Now we will set the names of the controls. The first button will be called back, the second forward, the third refresh, the fourth stop, the fifth home and the last GO. For the GO button set the alignment property to right. Now that you have the names we can set each of the button's DisplayStyle to Image. Set the proper images for each button. 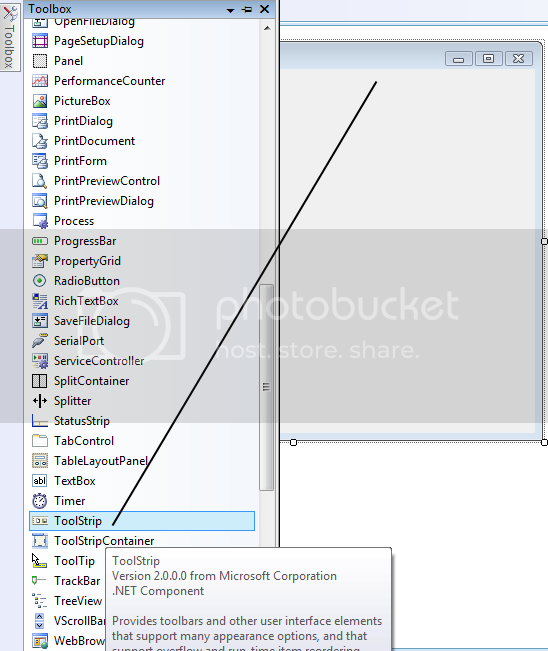 Now we will name the label and the textbox on the toolstrip. For the Label set the text property to URL: and the name to urlLabel. Now the textbox will be named url and the text leave blank. Next drag the WebBrowser Control onto the form. Double-Click on the Form and enter this code webBrowser.GoHome();. Double-Click on the Back Button and enter this code webBrowser.GoBack();. Double-Click on the Forward Button and enter this code webBrowser.GoForward();. Double-Click on the Refresh Button and enter this code webBrowser.Refresh();. Double-Click on the Stop Button and enter this code webBrowser.Stop();. Double-Click on the Home Button and enter this code webBrowser.GoHome();. Double-Click on the GO Button and enter this code webBrowser.Navigate(url.Text);. Double-Click on the webBrowser and enter this code url.Text = e.Url.ToString();. This is what your final design should look like. Now run the form and have fun! 2) How to remove the Scroll bar ? If I understand you correctly you are asking: 1. Hide the URL Text Box 2. Navigate to a page instead of Homepage on the load of the Browser 3. Remove the Scroll Bar? I am trying implement "highlight" method to above Web Browser. I desire to add a button that when it is clicked, selected text on Browser will will be highlighted. But i don't know how to do. Could some one help me ! Thanks, dude! This is great. I have a question... Is this safe to use? I'm not sure if it has any security...? Like IE or Firefox. But all in all, GREAT job! 1) How do I add tabs? Sometimes people, just want to restrict the user from scolling. Examples include Popup windows, Predefined Window Size(doesn't need to scroll), and any other reason. If you have any further question(s) about web browsers in general(and not on this tutorial), then you will get more help if you post it in the forums. i would like to set home button, but with posibility for user(s) to change it (meaning - ability to change home address)? You can find where the homepage is set in the registry or you can create a Property to save the homepage(which can be changed via an options dialog). Just make sure that the System.Properties.Default.Homepage exists(if not then create it) and that it is either a String or a URI type. How do you make the webbrowser control load a .html when you click it on windows explorer and so when it loads if you click it on windows explorer the webbrowser control loads it! 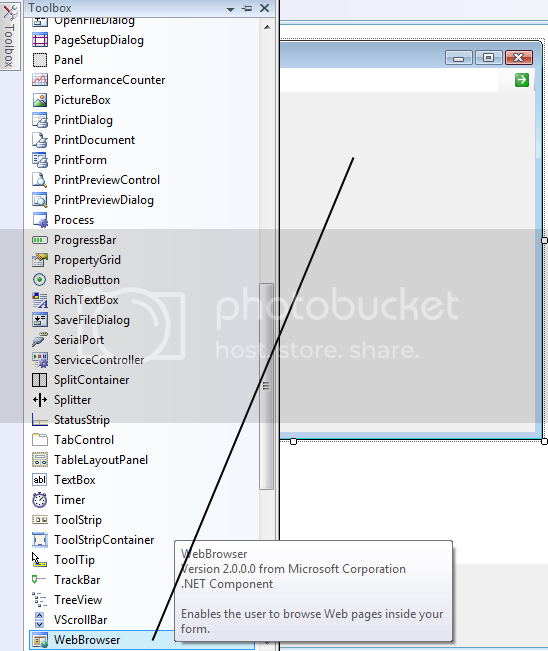 How Do I Skin A Windows Form Application In VC#?